I LOVE table runners. Seriously, they are just better than plain table cloths. I like that they expose the table but are still a nice little spread to lay your centerpieces over. I found this DIY table runner on Style Me Pretty. I really wish I had a sewing machine. It's my goal to become more crafty. Perhaps I shall make it a New Years Resolution. I also think I fell in love with this DIY project because I love burlap. Don't ask me why, but I just think it's cool. It can come off as artsy and organic yet masculine. I still find it pretty in it's own way, and totally do-able for a wedding. 1. Cut fabric in lengths of 14 feet, two inches. So... Who wants to let me borrow their sewing machine? I don't even care if these are for the wedding... I just think they would be fun to make! Just so you know, burlap can be really messy to work with. It gets in the air and everywhere when you cut it, so make sure to buy a mask or something too. Oh, thanks for the tip! 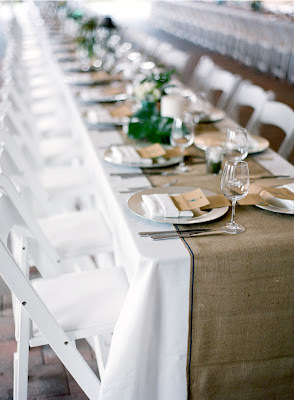 I would definitely like to use burlap somewhere in the wedding... so I will keep that in mind!